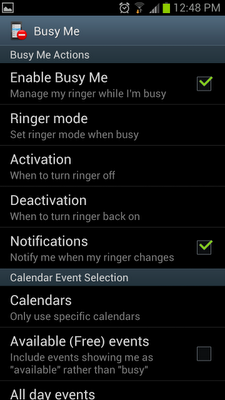 I'm lazy person and I don't like to turn my Android phone to silent or vibrate mode "MANUALLY" during meeting. I'm looking for something that can be done "AUTOMATICALLY". 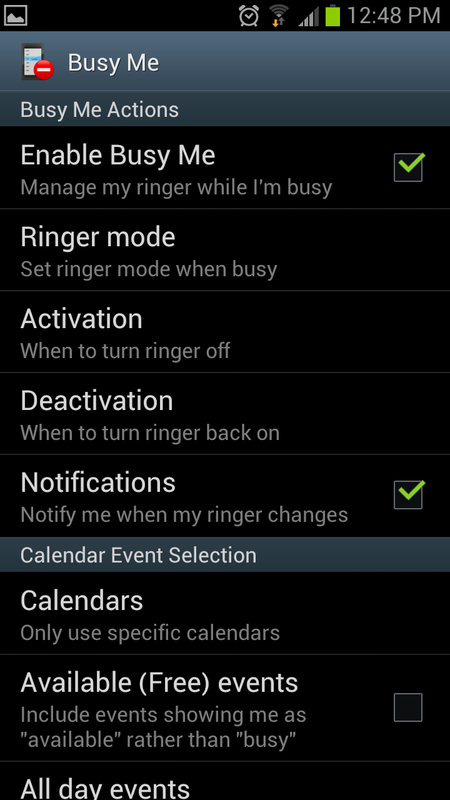 Probably I get used to my old HTC diamond phone (runs on Windows Mobile) which this feature comes by default. Anyway, I found this cool software called "Busy Me" and it gives me exactly what I wanted. I have been using this software using for quite sometime and encounter some minor bugs (sometimes it just doesn't work and I need to turn my phone to silent mode manually) but I think that is still acceptable. Most importantly, it is FREE! I turn off the "Notifications" because I think it is a useless thing. But if you want to get a sense of whether the "Busy Me" works as expected, you may want to turn it ON to see how it goes. The "Activation" and "Deactivation" can be set "On Time", 5 minutes, 10 minutes or 15 minutes early. I set it 15 minutes for both which means that my phone will be in "silent" mode 15 minutes prior to the meeting (activation) and 15 minutes after the meeting finish, my phone will be back to normal mode again (deactivation). To download this software, just do a search "Busy Me" in Google Play and you can also download it from Google Play here. 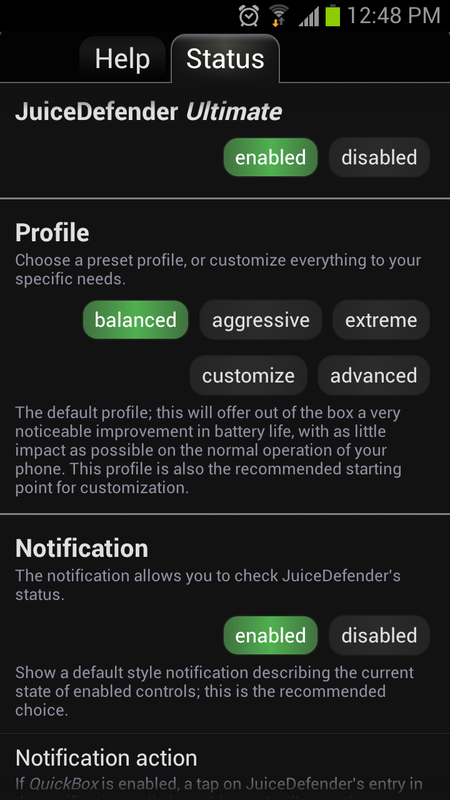 So far have been using "JuiceDefender" application for few weeks, I found it very useful especially you turn on your internet connection (especially for data plan/mobile data) 24 hours in your Android phone. That means if you do not turn on your internet connections (either WIFI or data plan/mobile data) for 24 hours and you not lazy to turn it off when you're not using or out of the WIFI range, then I don't think this "JuiceDefender" application is that efficient. There are few version of JuiceDefender (i.e. battery saver, ultimate, and plus). Battery saver is free version and the rest is paid version. The free version doesn't support the WIFI but still able to support the data plan/mobile data which I think that is good enough because "Mobile Data" is the biggest power consumption in phone. Choose "balanced" profile is good enough. The rest you can ignore. For notification, I advice you to enable it so that you can see the "Icons legend" and get a sense of whether your connection is ON. This is important because sometime JuiceDefender unable to connect back after you unlock your phone adn this "Icons legent" is the only indicator that you have. The full log tells you more about the activity. Go to help section it shows you how much power you can save with this applications. It is usually 2X! In short, if you enable internet connection all the time, I strongly suggest you to use this power saving application. However, sometimes you face some bugs then you will have to enable enable back the connection manually. 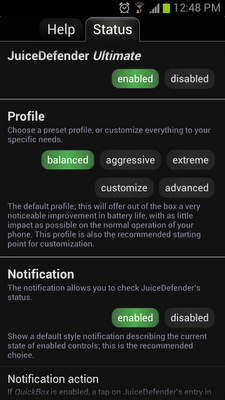 You can just search "JuiceDefender" in your Google Play or you can also it here. My Google account has been hacked before, thus I"m very concern about the security of my Google password. I appreciate the hacker just gave a warning to me and not doing anything that extremely damaging! Thank You! I will find all my best to protect the password and here are the tips that I"m going to share with you how you can strengthen your Google password security. Well, you may think this is not necessary but I think it is safer if you can change your password every quarter (i.e. 3 months). I will have my own pattern of creating new password, so I can easily remember. Of course, please make sure your password is the strong password too. Google will able to tell you that whether your password is strong enough. I believe this is how my Google account is hacked. For better security, only use your "mobile phone" as the only option to recover your password. This means you do not need to key in the recovery email address. If there is, please remove it. When you receive the SMS recovery password code, you will know someone is trying to hack your account. I honestly received it before few times! Another very important thing is the security question - do not use simple security question such as "What is my favorite color?". I think this is a very high potential the reason why my account was hacked because my security question is too simple to guess like the one above. Please use complex security question and make sure it is not easy to guess. I do not know the reasons why Google "enforces" this security question but this definitely open up to hackers to do their job easier. If you can disable this (assuming Google doesn't enforce this), then it is even better. Using mobile phone to recover password is the safest option in my opinion. Note: Not sure if this is Google bug, I remembered I tried to recover my own password only with this security question. Perhaps I didn't set other recovery options. I encourage you to try to recover your own password and see if it sends recovery code to your mobile phone or not. You can select your default machine to login, then Google won't ask you for 2-step verification. If you login from another computer, then Google will ask you that. It will send the verification code to your mobile phone through SMS. You can also download a list of verification codes just in case you do not have the SMS access. I suggest you do this by printing it out and keep it in the safe place rather than download the verification codes in your computer. I know this is ridiculous as all android phones are linked to your Google account. It really depends on how important is your Google account. If your Google account contains very important and confidential stuff (e.g. access to your paypal account, adsense and others accounts that related to money), I would suggest you not to link it with your Android phone if possible. Security in mobile phone is never safe! So, what I do is I create another new Google account is mainly to link to my Android phone. I feel this way is a lot more safer. Hackers will not have a way to link to your real Google account if they manage to hack into your phone. Also, what about you lost your phone? They only can hack to the Google account that is meant to be hacked! Note: If you really cannot live without your Google account, then I guess you need to be careful of not simply install third party mobile applications that are not approved by Google (Play) or Apple (itunes). Do you have any tips to share how you protect your Google account password?